Our top-of-switch rack decides to die randomly from time to time. It was somewhat inconvenient since it also killed most of our infrastructure including primary and secondary DNS so I needed a solution quickly. Since different rack is still on the network, I should be able to hack something and finally connect my Arduino knowledge and sysadmin realm, right? Think of it as power cycle watchdog based on network state. There is basically no solution. We are running latest firmware, and internet doesn't have any idea what to do. 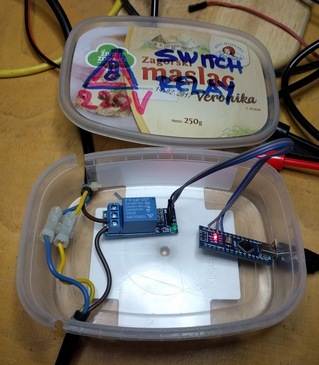 Serial console did emit a lot of messages, but didn't respond to input at all. I would at last expect that watchdog timer in the switch will reset it once it manages to fragment it's own memory so much that it has stopped forwarding packets, oh well.... What else can I do? I wanted something what I can plug in between the existing switch with IEC power connector with USB on the other end that can be plugged into any USB port for control. Since this is 220V project (and my first important one), I tried to do it as safe as possible. I started with a power cable, that I cut in half and put ferrules on all wires to be sure that connectors will grip those wires well. Then I replaced the power plug with IEC connector so it's can be inserted in any power cable. In this case, we soldered wires ends, since ferrules where too big to fit into connector housing. We did wrap a wire around a screw in a connector correctly, so tightening the screw will not displace the wire. Finally I connected cheap 10A 250VAC relay which should be enough for fully loaded 48 port gigabit network switch that draws round 80W. To make sure that rest of the system can't just power cycle device connected at any time, I connected live wire through normally closed pins on a relay. This means that this cable should work as-is (without powering it at all) and when powered, since board has pull-up resistor on the relay to VCC, the relay will be in the same sate, passing power to device. Finally I checked all three power cable wires with multi-meter and got around 0.2 ohms which mans that whole thing works for now. At this point we should note that this relay board has only three pins (IN, GND and VCC) and has no optical isolation to 220V side. Since isolation would require us to provide additional power supply for 220V side, it was acceptable a risk. I really wanted to somehow fix wires and protect the bottom of the relay board (which has 220V on it) from shorting to something, so I used an old box from a dairy product and created a housing for electronics. If you look carefully, you will notice that I had to cut the case all the way through to pass through the power cable (that has a zip-tie on inside to prevent it from pulling out). The Case will be fixed using hot glue and a lid, so this won't be a problem. Warning and label on the lid is also nice touch, and shouldn't be skipped when creating a thing which you won't be only user of. 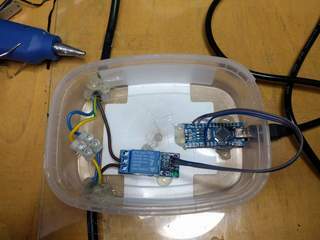 The idea is to use Arduino default pin state (INPUT) as a state in which the pin will stay most of the time. This makes pin floating, and we can inspect pull-up on relay board and report if we see it. When we want to activate the relay, we'll flip pin to output, pull it down, and activate the relay. * relay is connected across 5V relay through normally closed pins so that failure of arduino doesn't kill power to switch. Then, I applied liberal amount of hot-glue to fix power cables and board in place. It worked out pretty well. You will also notice that the relay pin has moved to D2. 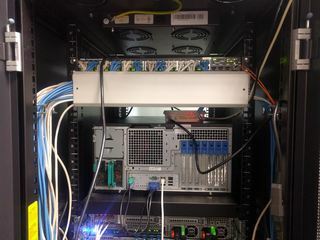 And here it is, installed between existing switch power cable and switch, connected to only USB port still available in rack which is still on network. Idea is simple: we'll use cron to ping primary and secondary DNS IP addresses and if any of these fail, we'll send 0 to turn power off, wait 3 seconds, and send 1 to turn power back on. Implementation, however, is full of quirks, mostly because we don't want to depend on additional utilities installed, and we need to wait for Arduino to reset after connecting to serial port (and to give it time to display value of relay pin) before we start turning power off. This will execute script every minute. This allows us to detect error within minute. However, switch boot takes 50s, so we can't just run this script every minute, because it will result in constant switch power cycles. But since we are resetting switch just once this is not a problem. And it's interesting combination of sysadmin skills and electronics which might be helpful to someone. If we want to access our servers while switch doesn't work, it's always useful to create few shell scripts on remote nodes which will capture IP addresses and commands which you will need to execute to recover your network. This week I learned valuable lesson: if you are using MIPS from 2008 in your RAID controller, you can't really expect it to be faster than more modern Intel CPU when doing RAID 10 on disks. It all started with failure of SSD in our bcache setup which sits on top of MegaRAID RAID10 array. Since this required me take one of ganeti nodes down, it was also a good opportunity to add one more disk (we where running 6 disks and one SSD) and switch to software md RAID10 so we can use all 7 disks in RAID10. In this process, I did some benchmarking and was shocked with results. So, TL;DR is that you are throwing away disk performance if you are using hardware RAID. You didn't expect that? I didn't. In retrospect it's logical that newish Intel CPU can process data much faster than slowish MIPS on RAID controller, but on the other hand only difference is RAID overhead because same controller is still handling disks with software raid. Today I was explaining xclip utility and found this useful snippet which I wrote back in 2011 that allows you to edit browser textarea in terminal using vi with syntax highlighting. These days, my work seems more like archeology than implementing newest and coolest web technologies, but someone has to keep an eye on old web servers which are useful to people. In this case, it's two major Debian releases upgrade which of course did result in some amount of breakage as you would expect. Most of breakage was easy to fix, but we had one site which had only pyc files, and python2.6 with correct modules wasn't supported on current distribution. First idea was to use python de-compiler to generate source python files, and this only got me to different python errors which I didn't know how to fix. so, this was dead end. I did have a backup of machine before upgrade on zfs pool, so next logical idea was to run minimal amount of old binaries to keep the site up. And I decided to do it in chroot so I can easily share mysql socket from current installation into pre-upgrade squeeze. Let's see what was involved in making this happen. Take a note of crossmnt parameter, this will allow us to mount all descending filesystems automatically. To make this work, I first edited apache configuration in chroot to start it on different port, and configured front-end server to redirect site to new port. This year on DORS/CLUC 2018 I decided to talk about device tree in Linux kernel, so here are blurb, presentation and video of that lecture. You have one of those fruity *Pi arm boards and cheep sensor from China? Some buttons and LEDs? Do I really need to learn whole new scripting language and few web technologies to read my temperature, blink a led or toggle a relay? No, because your Linux kernel already has drivers for them and all you need is device tree and cat. DORS/CLUC 2017: bro - what's in your network? This year on DORS/CLUC 2017, I talked about bro which is great network analysys tools everybody should know, but dispite it's long history is not as well known as you would suspect. For last few years, one of first tools which we install on each new server is etckeeper. It saved us couple of times, and provides nice documentation about changes on the system. However, git can take a lot of space if you have huge files which change frequently (at least daily since etckeeper has daily cron job to commit changes done that day). In our case, we have bind which stores jnl files in /etc/bind which results in about 500 Kb change each day for 11 zones we have defined. You might say that it doesn't seem to be so bad, but in four months, we managed to increase size of repository from 300 Mb to 11 Gb. Yes, this is not mistake, it's 11000 Mb which is increase of 36 times! Solution for this is to use git gc which will in turn call git-pack to compress files. But this is where problems start -- git needs a lot of RAM to do gc. Since this machine has only 1 Gb of RAM, this is not enough to run git gc without running out of memory. Let's start with our 11 Gb git repo, copy it to another machine which has 64 Gb or RAM needed for this operation. Now, we will re-create local files because we need to find out which jnl files are used so we can remove them from repo. Now, finally we can shrink our 11 Gb repo! Delta compression using up to 18 threads. Compressing objects: 100% (27385/27385), done. Writing objects: 100% (38117/38117), done. Removing duplicate objects: 100% (256/256), done. root@dns01:/etc# rsync -ravP build.ffzg.hr:/srv/dns01/etc/.git . Just as side note, if you want to run git gc --aggressive on same repo, it won't finish with 60 Gb or RAM and 100 Gb of swap, which means that it needs more than 150 Gb of RAM. So, if you are storing modestly sized files which change a lot, have in mind that you might need more RAM to run git gc (and get disk usage under control) than you might have. Last week I head pleasure to present at two conferences in two different cities: DORS/CLUC 2016 and Osijek Mini Maker Faire on topic of cheap hardware from China which can be improved with little bit of software or hardware hacking. It was well received, and I hope thet you will find tool or two in it which will fill your need. I hope to see more hacks of STM8 based devices since we have sdcc compiler with support for stm8, cheap SWIM programmer in form of ST-Link v2 (Chinese clones, which are also useful as ARM SWD programmers) and STM8 has comparable features to 8-bit AVR micro-controllers but cheaper. Every few years we have to renew SSL certificates. And there is always something which can go wrong. So I decided to reproduce exact steps here so that Google can find it for next unfortunate soul who has same problem. We are done, restart slapd and enjoy your new certificates! When I started playing with Raspberry Pi, I was a novice in electronics (and I should probably note that I'm still one :-). But since then, I did learn a few things, and along that journey I also figured out that Raspberry Pi is great little device which can be used as 3.3V programmer for AVR, JTAG, SWD or CC111x devices (and probably more). I collected all my experiences in presentation embedded below which I had pleasure to present at FSec conference this year. I hope you will find this useful.